The six mile Trolley Trail runs north-south, passing residential neighborhoods, retirement communities, parks and business districts along the way. The Trolley Trail is located within a former Portland Traction Co. streetcar line right-of-way. The streetcar service operated between Portland and Oregon City from 1893 until 1958. Freight service continued until 1968, when rail service was abandoned completely. Since that time, citizens and public officials have advocated to preserve the rightof- way for a future recreational and/or commuter trail. The communities of Milwaukie, Oak Grove, and Jennings Lodge were located along what became the streetcar corridor. In 1850, Milwaukie consisted of a sawmill at Johnson Creek and a number of surrounding farms. The community of Oak Grove, named for a large stand of oak trees at its northwestern end, was platted in 1890. Platted in 1905, Jennings Lodge was another small community that the streetcar line would eventually serve. After the rail line was built, development along the corridor flourished. Oak Grove and Jennings Lodge both expanded to include more residences, public buildings and stores. Houses adjacent to the corridor were built with their porches facing the rail. In the late 1890s, typical homes surrounding the streetcar were simple wood-frame buildings commonly referred to as Vernacular or Western Farmhouse styles. The homes built around 1900 typify newer American styles, such as the Craftsman-Bungalow, which was possibly the most popular architectural style through the 1920s (Clackamas County Cultural Resource Inventory, 1992). Examples of both the older farmhouse and Craftsman-Bungalow style houses still exist along the streetcar corridor today. To capture the character of the streetcar during its years of operation, this subsection describes the stations and relays stories shared by residents who rode the trolley. Station details and personal stories and memories were collected during the May 15, 2002 Trolley Tales event. Station details were also collected through historic photographs and written text. The determination of the historic trolley station locations is limited by our interpretation of historic hand-drawn maps and the accuracy of resident accounts. The number of stations and their names underwent minor changes throughout the operating years of the streetcar. The original stations got their names in one of two ways. The names were either descriptive of the natural surroundings or they were provided by the owners of the land surrounding the corridor shows the stations as they existed in 1938. Below, each of the stations are described from north to south. Available photographs collected by the team are included. 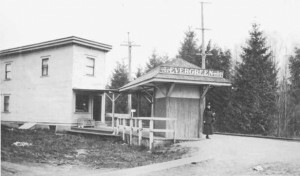 Milwaukie Station was located near what is now Vic’s Tavern on the west side of McLoughlin Boulevard. This station took the name of the city it served, and in 1915, the station consisted of a covered waiting platform with benches. The station was in front of an American Express Company office and an ice cream and soda shop. 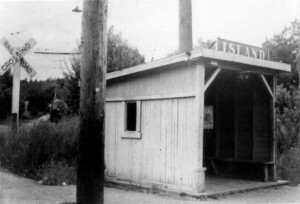 Island Station, the next stop, was located just north of what is now the Yes! I Do Bridal store at the intersection of 22nd Avenue and McLoughlin Boulevard. This station took its name from the nearby Rock Island in the Willamette River, known as Elk Rock Island today. In 1933, the station consisted of a small freestanding wooden shelter. Earlier photos of Island Station show it next to a muddy road, possibly an early River Road, with a sign for an Open Air Sanitarium. 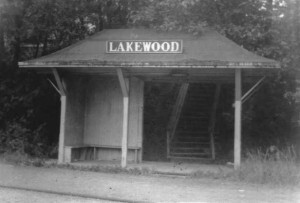 Lakewood Station was located near Kellogg Lake. From Island Station, the streetcar traveled up a hill, past the lake, and through a deep stand of first. The station was appropriately named after these natural features. A 1915 picture shows trolley cars within the vicinity of the station. static was located at the northwest comer of the intersection of the streetcar line with Park A venue. It is fondly remembered by local residents who used to buy pieces of penny candy at the small store adjacent to the station. Others re member that to get to the station from the east one had tc cross a wooden bridge over a small gully. The gully was filled in during the construction of the “Super Highway,” known today as McLoughlin Boulevard. Silver Springs Station is the next station continuing south. It was named for a spring in the area. Residents who used to ride the trolley remember that the station was located at the intersection of the corridor and what is now Silver Springs Road. Torbank Station was located approximately where Torbank Road currently meets the trail right-of-way. The station was named by the wife of Joseph J. Price. Her husband gave land for the station. Irish chicken farmer, although the land previously belonged to the Broetje family and was used as a nursery. Saint Theresa was located on the east side of Arista Drive about halfway between Courtney Road and Oak Grove Boulevard. It was named for Sister Theresa who established “The Little Flower” sanitarium at this location. A large evergreen hedge near the intersection of Arista Drive and Pine A venue reportedly marks the location of the sanitarium and the station. Oak Grove Station was located in the community of Oak Grove at the comer of Oak Grove Boulevard and Arista Drive. Oak Grove offered stores, a post office, and gathering places clustered along Oak Grove Boulevard (called Central Avenue until around 1913). 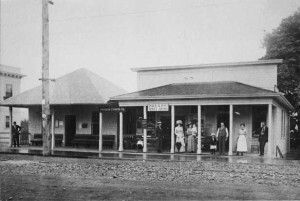 The station’s stop and ticket office were once located in the general store, which now houses the Oak Grove Bar and Grill. Rupert Station was on more sparsely developed land and was reportedly located just after the corridor turns to the east, near present day Third Avenue. Risley Station was the next stop and its name recognizes one of the more prominent families in the area. The station was a small shelter located at the northwest comer of the intersection of the corridor with Swain Avenue. Today members of the Risley family continue to live in the area around the corridor. Concord and Vineyard Stations were the next two stops. It is unclear how either station received its name. Both stations were on land that once belonged to the Andrew’s family. Concord Station was reportedly located at the northwest corner of where Concord Road now intersects with Arista Drive. The station may have been named after Concord, Massachusetts or for Concord grapes that early pioneers tried to grow in the area. Naef Station was also named after a prominent family. Similar to the Risley family, members of Naef family still live in the area. Roethe Station, the next stop, was located approximately at the intersection of the corridor and Roethe Road. Just past Roethe Road was Ashdale Station. The station was located approximately at the intersection of current Boardman Avenue with the trolley corridor. Jennings Lodge Station was named for the Jennings family. The station was located near the present day intersection of the trolley corridor and McLoughlin Boulevard. This stop offered commercial stores, a post office and meeting places. It was also a very popular destination for youth and teenagers. Long-time residents recall getting off the trolley at this stop and walking north to Roake’s Hot Dogs. Meldrum Station was named for the family that previously owned the land. The station was located along Abernethy Lane. Fern Ridge was the last station in the study area and was located just north of present day Glen Echo Avenue. *Thank you to PSU Masters of Urban and Regional Planning students Jennifer Bell, Jennifer Hughes, Michelle Healy, Beth Park and Stacy Burnett for much of the background information. (June 2002) Photos courtesy Richard Thompson.